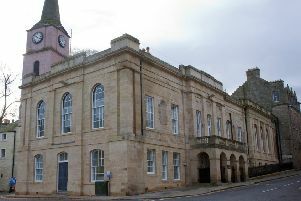 A 31-year-old man has been fined £400 at Jedburgh Sheriff Court for brandishing a metal wheel brace during a road-rage incident in Hawick. Radoslaw Farbis pleaded guilty to behaving in a threatening or abusive manner in Weensland Road on the morning of June 4 last year. The court heard that he had got annoyed with a van driver in front of him. Farbis, of Inchmyre, Kelso, then overtook the van, pulled in front of it and got out of his car holding the metal wheel brace. The van driver was alarmed by his conduct, and an onlooker contacted the police. Defence lawyer Mat Patrick said his client acted without thinking. He had taken umbrage at the manner of driving of the other vehicle and picked up the wheel brace as it was sitting next to him when he went to confront the driver. Sheriff Kevin Drummond told Farbis his behaviour was totally unnecessary.